It is a tale of a candle and two moths. The only difference in the tale is that there are not two men but two women fighting each other over their ‘flame’. Both of them claimed to be married to the same man. One of them is a constable. The man is also a constable. The Economic Offences Wing of the Delhi Police today claimed to have busted a biggest-ever racket of manufacturing and selling counterfeit Indian postal, revenue, foreign bill stamps and non-judicial stamp papers with the arrest of four persons. 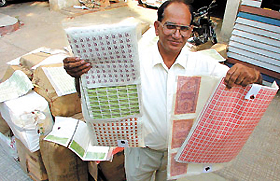 Crime Branch officials display some of the fake revenue and court stamp papers. People seeing others slipping on a banana skin find the scene quite amusing, but they forget that some day they themselves may slip on the same peel. Throwing a banana skin in open is a bad civic manner. One pays a heavy price for others’ ‘slippery’ habits. There are times when people have even lost their lives. Still many of them do not mind their P’s and Q’s. Only a handful are civic enough to ensure remedial measures. 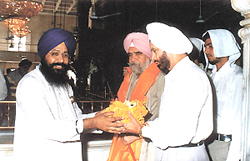 Punjab Director General of Police M. S. Bhullar being presented with a saropa by Giani Ranjit Singh, Head Priest of Gurdwara Sis Ganj Sahib, on Saturday. 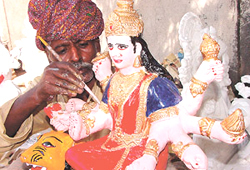 A roadside painter gives final touches to an idol of Durga for the forthcoming festival in the Capital on Saturday. Gurgaon and its neighbouring areas have become the developmental model for Rajasthan Government. Taking a cue from its neighbour, the Rajasthan Government has decided to introduce a new set of building regulations. The Senior Superintendent of Police, Ghaziabad, Mr Chander Prakash, has suspended four cops for dereliction of duty and posted sufficient police force and some PAC jawans at Faruqu Nagar village in Sahibabad to prevent any further damage. Responding to former MLC Puran Chand Azad’s threat to undertake a fast-unto-death, if the Deputy Commissioner did not stop `vandalising’ the city in the name of beautification, several social and apolitical organisations have appealed to the district administration to continue the drive in public interest. The National Capital Region Board has slapped a penalty of Rs 30 lakh on Ghaziabad and Pilkhua-Hapur development authorities for having refused to take a loan of Rs 3,162 crore, which had been sanctioned by the board on their requests. Mr S. N. Roy, Deputy Commissioner of Sonepat, has given a big boost to the face-lifting programme and development schemes in this city and elsewhere in the district. After taking over as DC, Mr Roy took keen interest in the development of Sonepat city, which is a district headquarters in Haryana. The HVP secretary-general, Mr Surinder Singh, today made it clear that his party would go it alone in the forthcoming Haryana Assembly elections. Thousands of residents living in the old section of the city, particularly in the areas of Ram Bazar and Mohalla Kalan, remained waterless again last evening following the stoppage of drinking water supply by the Public Health Department. However, the officials of the PHD have given no reason in this regard. Reducing ground coverage, compulsory water harvesting and plantation, use of alternative renewable sources of energy, eco-friendly construction materials and energy conservation are some of the recommendations made by leading engineers, architects, town planners, designers, building material manufacturers and administrators for the National Building Code (NBC) of India for sustainable development. The Shekhawati region lies in the triangular area between Delhi, Jaipur and Bikaner. In the early 14th century, a number of Muslim clans moved into the area, thereby giving rise to a township, which developed into an important trading post on the caravan routes emanating from the ports of Gujarat. While there have been reports that diesel-run buses banned in Delhi have spilled into the NCR towns, some of these have been found operating illegally. The roadways authorities here have stepped up the vigil after impounding at least three such buses in the past three days. It is perhaps the only place where you are likely to meet a 100-year-old former soldier from Jhajjar and the Royal Gayatri Devi together, separated by a few leaves of paper. Samar S. Jodha’s book, ‘Ageless Mind and Spirit’, an eight-year’s effort covering 400 individuals from varied backgrounds, may well pass off as a coffee table must, but the images in black and white stare straight into the eyes, leaving an impression. I shall work for an India in which the poorest shall feel that it is their country in whose making they have an effective voice, an India in which there shall be no high class and low class of people, an India in which all communities shall live in perfect harmony. One person was killed and six others were injured in a road accident involving a canter and a truck near Samkhol village on the national highway No. 10 here today. The Sarva Shiksha Yatra, started by teachers, paid tributes to Mahatma Gandhi on the 14th day of their expedition. Mr Deep Chand Bandhu met the teachers yesterday at Rajghat and appealed to them to help eradicate child labour in the country. More than 2,500 representatives of various companies, located in and around Gurgaon, visited Northindex, an exhibition of north Indian industries, at HUDA Gymkhana Club, Sector 29 here. Various activities in the three-day exhibition that concluded today kept up the excitement of the entrepreneurs. Hero Honda, world-renowned two-wheeler company, has launched its nation-wide `Ride Safe Campaign'. 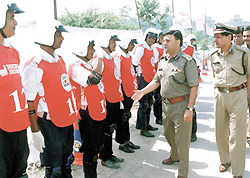 A safe riding training programme for the Delhi Traffic Police as well as for its customers is part of the campaign. Joint Commissioner of Police B. K. Gupta meeting participants in the safe driving training programme for Delhi Traffic Police at Patparganj on Saturday. The impasse between the University Grants Commission and the Delhi University Teachers’ Association ended on Tuesday with the final decision on teachers’ workload being taken by the Academic Council. But, there are several issues – which had been pushed to the background by the more controversial workload issue – that still remain unresolved. About a hundred children from various schools of Delhi, joined hands to launch the ‘Join Hands Campaign’, a new movement for the elderly. Launched on the International Day of Older Persons (October 1), the campaign is aimed at involving senior citizens in the process of social development. Dr R N Kalra is a well-known heart specialist with hundreds of successful heart surgeries to his credit. Presently, he is chairman of Kalra Hospital and Shriram Heart Institute. A brilliant all-round performance by P P Singh, who claimed three wickets for 13 runs and then blasted 42 runs, helped Scindia Club India beat West Delhi Cricket Academy by seven wickets to sail into the semi-final of the second Shaheed Smriti Under-19 Cricket Tournament for the Rameshwar Trophy, organised by the North Delhi Cricketers’ Association, at the Ashok Vihar ground. Dashing batsmanship by Gaurav Chabra (92), Ratan Rawat (80) and Shikar Dhawan (69) and deadly bowling by Maninder Singh (4 for 15) and Narender Singh (4 for 2) helped defending champions Salwan Boys beat Mary Home School by 226 runs in the third Parle Cup Inter-School Under-17 Cricket Tournament at the Salwan ground. Modern School, Barakhamba Road trounced J L DAV School 6-0 in a Cluster X junior match of the Central Board of Secondary Education (CBSE) Soccer Tournament, organised by the Ganga International School, at its ground on Sunday.